Building creative solutions. Designing, supplying, installing and maintaining. At UK Racking we install pallet racking systems to the highest standards to meet your requirements. We work with several top manufacturers to supply only the highest quality at the right price. 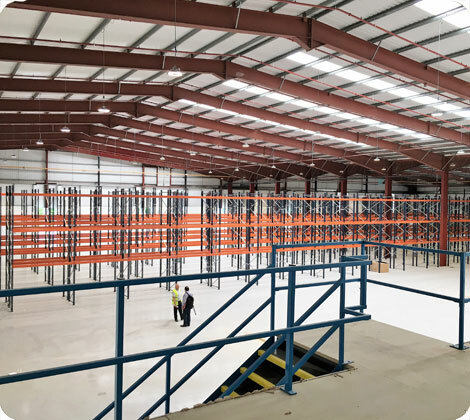 Whether it be pallet racking installation or the installation of a mezzanine floor or even a commercial interior, we always work to the highest standards available. Whatever your needs we will install the very best equipment available. We design solutions for pallet racking, mezzanine floors and commercial interiors. Whatever your needs simply get in touch to discuss and we will try to assist you..
We supply the ultimate in Pallet Racking, adaptable to meet your needs with a strength and durability second to none..
We install your pallet racking exactly to your specification, providing your storage solution as agreed to your satisfaction..
Its always important to have a reliable partner who can help you maintain and service your pallet ranking, making sure of your safety and ongoing peace of mind..
Why not give us a call on: 0115 947 4532 for friendly free advice.